Lovely unit in a beautiful resort. Great ocean views. Easy access to resort beach, dining, and pool. Unit was well-appointed and clean. Beds were comfortable. Bedrooms and bathrooms were spacious. Living area very comfortable, modern kitchen with all appliances. Perfect unit for my husband, myself, and our 2 adult children. Good location for driving distance to both north and south shore attractions, with shopping plaza and grocery store directly across the street. 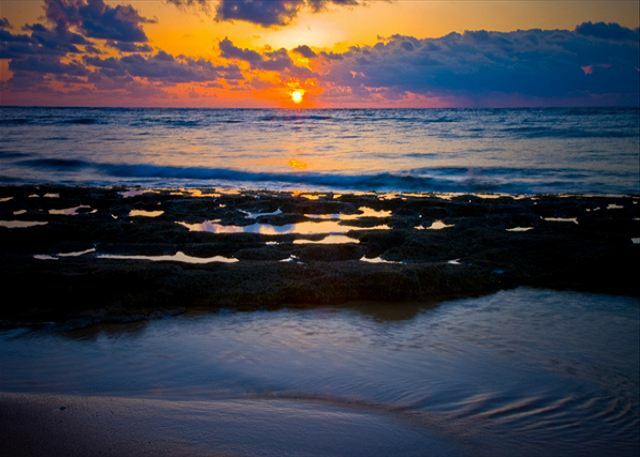 Kauai Exclusive Management team was attentive and thorough, making overall booking and stay stress-free and easy. Concierge was wonderful! Wonderful time at this condo. Beautiful location. Sunrise from the balcony!! Great location and ocean front view! A206 is well represented in the ocean views it shows from its pictures. There are 3 balconies (only one is big) that allows doors to be left open. What’s more is that this place is protected from the elements, like rain and wind. We had an abnormal amount but could still leave the doors open and remain protected. The location is a great place for walking to town and shops, as well as drive north or south to different parts of the island. The interior is adequate and set up nicely. Quite Possibly the Best Unit in the Complex! 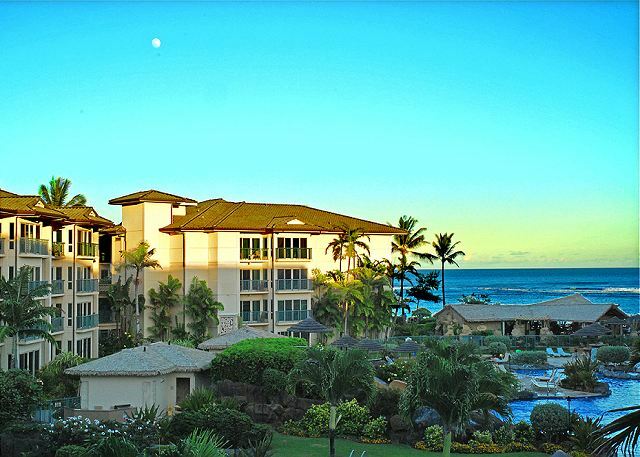 Staying at the Waipouli Beach Resort was such a wonderful experience! I would highly recommend this to everyone looking to stay on Kauai. 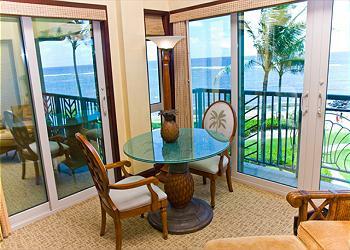 The condo was spacious, had excellent views of the beach and water. It quite possibly could be the best location in the complex with privacy, yet stunning views. The rooms were comfortable, and was a great place to be with a family - grandparents had their own space, and the bathroom was large enough for the pack n play where our baby girl slept wonderfully. 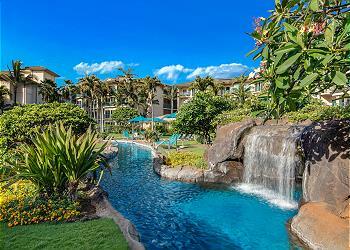 When we come back to Kauai, this will be my first choice of where to stay. As usual, a great stay in a great facility. We stayed at unit A206 for two weeks, building A is in one of the best locations in the complex, with beautiful beach views and tucked away from the busy pool area. The unit is ideal for a family of four, with a very large and well equipped kitchen. Also found the unit to be very quiet and private. The unit was nicely furnished and we found the beds very comfortable for our stay. The photos and description on the website were very accurate with regard to the current state of the unit. Overall very nice property, great pool area with large lazy river, the beach is great for reading and not swimming and the gym was pretty good as well. We also found the property manager very attentive and responsive. This condo was everything we had hoped for and more. Celebrated our 20th wedding anniversary along with our 14-year-old son who loved the condo as well. Feels like a home away from home. Nothing like falling asleep and waking up to the sound of the crashing surf just outside your window. Perfect location, close to everything. Can\'t wait to return! Thank you! We enjoyed our stay very much. Property was as described, beautiful view, nice ocean breeze. Beach is not for snorkeling or swimming. Too rough and rocky. The kitchen was sparse and completely lacking: no grilling utensils, one small pot, no cocktail glasses, no cooler or boogie boards like other condos had. We really enjoyed staying in these condos. I was a super location. You can get to north side and south side of the Island in a hour. The condos are clean and have a wonderful view. A beautiful condo right on the ocean! This unit provided a feel of quiet privacy, while being part of a somewhat large resort. Unfortunately, we arrived just before the unheard of rains/state of emergency, which allowed us plenty of time in the unit. Well appointed kitchen! Comfortable mattresses. Unbelievable bathrooms. We had a wonderful 8 day stay in Unit A206 of this resort. The unit was clean, well-maintained, roomy, and the beds were very comfortable. The location of the Waipouli Beach Resort is perfectly located, with a shopping center across the highway (easy access) having all the essentials that we needed to buy during our stay. Our unit was ocean front and we delighted in the ocean breeze both day and night. The resort has an "on campus" restaurant (the Oasis) which we used mainly for our breakfasts. However, we enjoyed a couple of excellent dinners there, too. Our main activities revolved around exploring Kauai by car(the north shore, Waimea canyon, and the PuPuli area), and a luau plus a round of golf in Lihui. The island is beautiful. 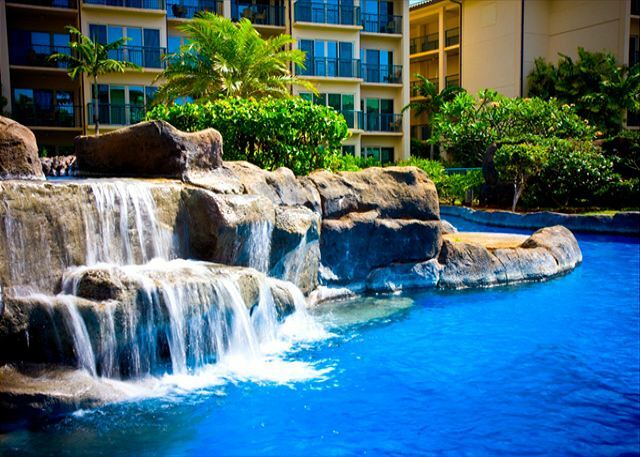 We would recommend both Kauai and the Waipouli Beach Resort to anyone seeking a relaxing vacation on a lovely Hawaiian island. This is a lovely, well located and appointed 2 bedroom apartment. 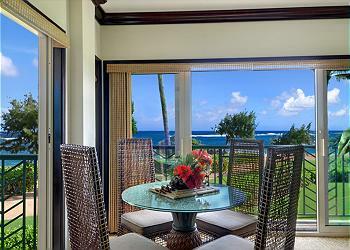 The position is sensational with wonderful ocean views and sea breezes. The beds were incredibly comfortable and the kitchen well equipped - even included some condiments, sauces, cling wrap etc. The onsite restaurant is quite good and you can hire bicycles from the onsite Spa. The close-by coastal ride is absolutely wonderful and well worth doing (even if you're like me and haven't been on a bicycle for more than 45 years!) Safeway, Foodland and other shops/restaurants are directly across the road which makes eating options very simple. There are a couple of maintenance issues within the apartment (which hopefully can be easily rectified) - the doors leading out from the lounge to the narrow balcony cannot be locked and the screen door leading on to the seating area verandah was off its rollers and could not be used. Unfortunately we did not receive the instructions/ code to enable easy, checkin access to the property prior to our arrival. If not for the incredibly helpful concierge at the property I don't know what we would have done. She went out of her way to ensure we were looked after. The on-site resort management company/reservation desk will not help you one little bit as they do not manage this property. They would not even allow me to use their telephone (despite my offer to pay for the call), so don't expect any help here. Once direct contact was made with Kauai Exclusive Management everything went smoothly but it would have been much better to have access details to the apartment before we arrived. All in all though, this was a great stay and one I have already recommended to friends back in Australia. This was one of three condos we rented, all next to each other, for our family. It was beautiful in every way, clean, photographs represented the unit well. No problems with the management company, they responded quickly to any questions we had. Resort was beautiful, although a bit windy. 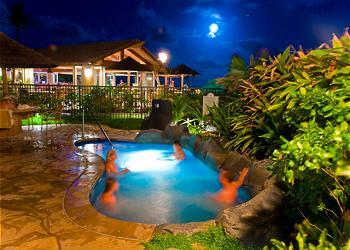 Pool is awesome for the kids and jacuzzis were perfect for nighttime! Would definitely rent here again! This vacation condo was perfect. Location, accommodation, pool & beach all met our needs & surpassed. Location, we were close to everything, shopping, restaurants & a short drive to our desired attractions on the island. Accommodations, the 2 queen beds in one room , king in another was perfect for our reunion, the condo was immaculate, the ocean view from the lanai perfect. The pool is fantastic( although the entry codes are quite long) & a baby monk seal entertained us on the beach! Plenty of chairs to watch the sunrise too! The rental app made it very easy for us to communicate with our host. As always, a wonderful location and very nice accommodation. The only real glitch was that the refrigerator's ice maker did not work, despite efforts of the staff to fix it. Four of us shared this unit for a week in June and greatly enjoyed our stay. It was a perfect set-up for a couple and 2 friends as part of a family reunion. Our group stayed in 4 units here. Our view from the lanai was fantastic. Waipouli resort was amazing and the facilities were exceptional. We enjoyed the pool area and The Oasis restaurant. The location was perfect for travel to the north shore on some days and the south shore on others. The unit was well supplied with toiletries and laundry soap along with many basic kitchen spices and counter top appliances. I loved Building A and would gladly return for another stay. We loved it and would definitely stay there again. The condo was awesome in terms of the view, cleanliness, and size. 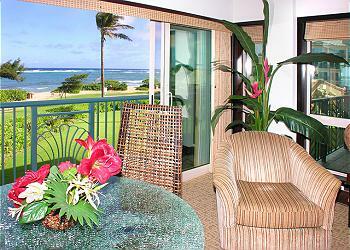 The beds were comfortable, nice big kitchen, and an awesome lanai over looking the beach for reading in the morning. We did have an small issue with not having bedding for the pull-out the first night but this was resolved immediately by Josh. Thomas, our concierge, gave us some great advice on spots to snorkel and surf. Location was great in terms of visiting the North and South shore (seemed like it was in the middle). Kind of a bummer that the beach in front of the condo was not the best for swimming or snorkeling but there is a nice beach just 5 - 10 minutes away. Definitely check out Ono Ono if you want to get some shaved ice. Overall we had a great stay. We love this resort, this building (Bldg A), and this was a nice Bldg A unit furnished with a comfy king and two queens. This was our second stay. Like our previous stay, it was extremely comfortable and convenient. The sound of crashing waves by day. At night, we like the AC for easy sleeping but you could sleep to the sound of the ocean as well. 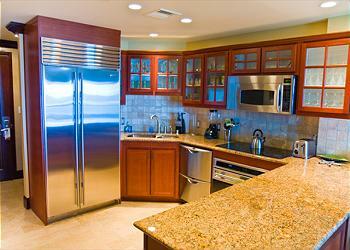 Kitchen is high end with subzero, granite, and well outfitted with toaster, blender, etc. On site restaurant and bar is great. Poolside there are always lounges open, or sit on lounges on the beach; again, always some open. Walk to Coffee Bean, Starbucks, grocery, and at least 20 restaurants within a half mile. We all agreed... best vacation spot ever!! 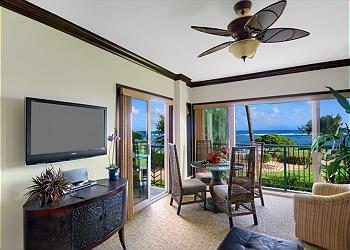 I seldom provide reviews but our experience with A206 Waipouli Beach Resort was so exquisite that I must. First of all... the management company is extremely professional. From our very first inquiry; to making the luau arrangements for our last night; everything was perfect. The condo was absolutely spotless and included dishwasher soap, laundry soap and toiletries. There were 2 couples sharing the unit. Each bedroom had equal accommodations with an attached bath. The views from each bedroom, living room and kitchen were breathtaking. We sat on the lanai each evening with a cocktail and listened to the waves. The unit had everything we needed to prepare meals. It was also well located to excellent restaurants when we chose not to cook. We were within walking distance of Kappa and enjoyed walking to the shops. All attractions were within an easy drive. The resort itself is beautiful. Well maintained, plenty of beach chairs, grills available for cooking, hot tubs with sandy floors for relaxing. I just can't say enough about the whole experience. The only negative may be that the beach is not swimmable but there are locations in close proximity that are. I highly recommend the island, resort, the unit and the management company. The island was a wonderful respite after 3 days in Honolulu. Quieter with breathtaking beauty everywhere you look. You will not be disappointed! We had an amazing time. The room was great. Beds were comfortable, plenty of space for us. The view is amazing, the ocean is steps away. Everything was clean and the kitchen had everything we needed. The appliances are very nice. The pool is great for kids and adults. I can't wait to come back. My kiddo said it is the best place we have stayed in our 3 visits to Kauai. We really like the location on the island. Nothing is too far of a drive to get to. Thank you. This is a great spot if you love Kauai! The pool is nice but not so much for kids under 3 years old. 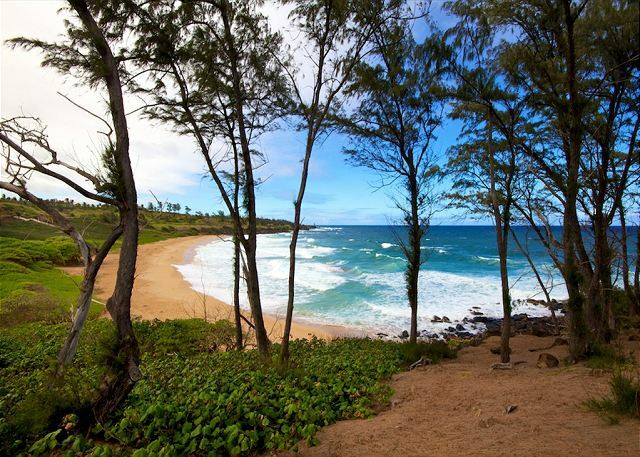 It's close to Kapaa and is nice and quiet, great spot! 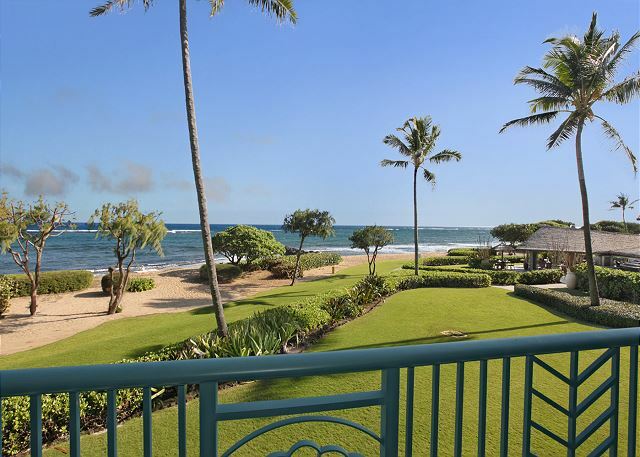 Great Kauai rental, good location! Great place to stay, this is our second time here. Stayed here last year, same condo. Love the place, nice 2 bedroom condo, good size, convenient location, amazing pool, ocean out your door, and love falling asleep to the sound of the waves from A206! Not good swimming in this area, if that is important to you. We LOVED this condo! My family said it was the best condo we've ever rented! We were close to the beach (not swimmable but loved hearing the waves, wading out and seeing the seals), loved having the pool and the lounge/restaurant (made friends with the bartenders and some locals)and totally enjoyed all of the décor, room for our stuff and items provided. Condo was right across from grocery store, which we visited daily. Loved it! So much more than we expected!! A206 was beyond our expectations. The view was amazing and the inside of the condo was clean and inviting. Loved to hear the waves crashing on the beach from our room. Morning coffee on the lanai watching the sunrise indescribable. We had a monk seal stay on the beach right out front for a whole day. The communication both before and during our stay was great. The only negatives would be the small parking area near our building and the busy intersection out front of the resort. We were so busy exploring the island that we never tried out the pool area. Would stay here again next time. This is an amazing property. Beautifully situated with an amazing ocean view....steps from the beach! Beautiful furnishings, wonderful pools connected by a lazy river. Water slides! Centrally located! The most amazing part of this vacation was working with Kauai Exclusive was my first time working with this management group, and they were outstanding! I can not praise them enough! We loved our week-long stay in A206. 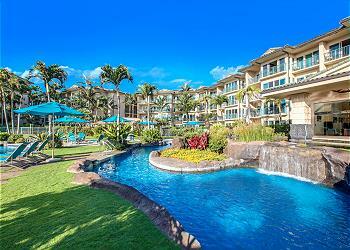 The unit is exactly as pictured, in a prime location within the resort, and the views are incredible. The bedrooms are very spacious, and we had plenty of room for four. The pool area is beautiful, and the resort is very well maintained. The beach, just a few steps away, was always quiet and we ended most days there with an evening cocktail. The meal we had at the adjacent Oasis restaurant was outstanding, and worth every penny. My parents, both near 80, loved that Kapaa town was within easy walking distance, and my mom particularly enjoyed the quaint shops there. 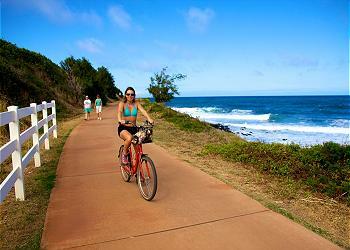 It's very easy to travel north or south from Waipouli Beach Resort, making it a perfect home base. We'll be back! As usual, we thoroughly enjoyed the unit. 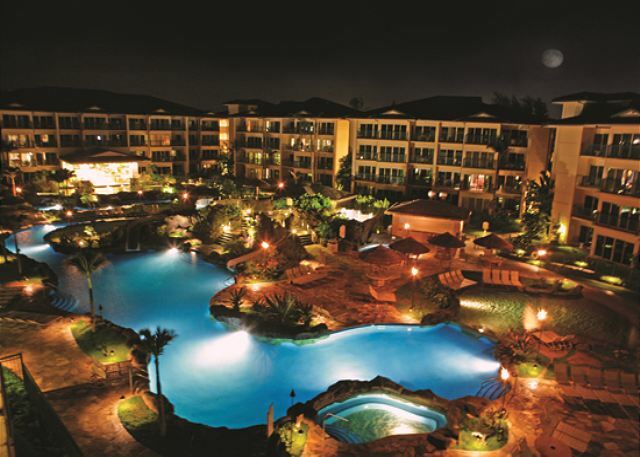 This resort is in a perfect location for a variety of activities. Great gathering place for families! Peaceful and Serene! We will return! We stayed at the Waipouli Beach Resort the week of 07/01/16 thru 07/08/16. We were in unit A206. Our unit was roomy and stocked with plenty of things we needed for our stay. Great view from three balconies. Nice kitchen. Washer and dryer really helped. Location is great to get anywhere you need to go. Traffic can be thick in Kapaa, but the island is beautiful and worth any time spent in traffic. Nice pool and hot tubs on property as well as a really nice indoor/outdoor restaurant called Oasis. My only suggestion would be to get an ocean view unit on the 2nd floor or higher. We were very happy with this unit. Lovely, quiet condo. Great view of the ocean. The kids loved the pool and slides. Location was convenient. This condo was just perfect for us. It was quiet, private, spacious and beautiful. The view just couldn't have been better. We'd definitely stay here again. It was perfect for us. The only caveat I would put out there is that we had two teenage girls with us who probably would have appreciated a more 'busy' beach. This beach is not a swimming beach and is relatively quiet compared with some like south shore, but there are other busier beaches very close of course. There are many walkable restaurants and shops from here which was also nice. Downtown Kapaa was great for shopping and restaurants as well. We were able to go to North shore and South shore attractions easily. As far as the condo itself. Everything was great, the beds are very comfortable. Great location. You can watch the sunrise over the water from the balcony. The condo has everything you would need to be comfortable. More private than many of the other units. Location made it easy to do things on the North and South ends of the Island. The pool is beautiful and the three hot tubs were a nice option. I would recommend this place to others, but there were a couple things that needed to be addressed. The faux leather fabric on the ottoman is peeling and it cheapens the look of a beautiful place to stay. The grout and tile in the master bath needs a good steam clean. When I tried to wipe water off the floor with a towel it stained the towel because there was so much dirt in the tile and grout. Beautiful Stay in Kauai, as always! The unit was clean and well stocked for us and our two small children. It's perfectly situated on the oceanfront, the food at the restaurant was amazing and our stay was perfect. The staff at Kauai exclusive was so helpful as usual. Can't wait to go back next year. Only condo I've stayed in where both living room and master bedroom face the ocean, and the views are great. On the downside, some of the furniture needs replacing. Kitchen needs basics like placements. Just a wonderful 9 days in unit A206. The unit was even better than we expected and the location was perfect. Everyone was so helpful and the grounds were so beautiful and well kept. If coming to Kauai again we would definitely enjoy staying in A206! My family had wonderful time staying at the unit A206. They have been coming back every year and staying at Waipouli beach resort for past 8 years. They liked the this unit very much. Thank you again. Very good location. The apartment condition generally is good, but a little bit tired. The some problems -air condition and place for throw garbage. Note, that you should have your bath amethyst, because you will have only one started set. The Resort have a beach, but beach not acceptable for swimming. Pool is ok, but a lot of people during the day. The BBQ places located on the pool territory. Strongly recommend have a apartment with ocean view. A lot of apartments have a view on parking or pool. If your main stream is journey around Kauai -it's a good choice. If you prefer stay on-site most days, thinking about accommodate with swimming beach. Opposite of Resort locate the SafeWay store. It's very comfortable. This 2 bedroom, 3 bath condo unit was the perfect spot for our stay. We were there for a wedding. I traveled with my brother, my mother and stepfather. Waipouli Beach Resort is centrally located on the east side of the island, and is within a short 10 minute drive to the airport. It is also across from a very handy Safeway grocery store, Starbucks, and some nice restaurants. This unit has a wonderful beach view, and seems so much more private than the other units. It is extremely well appointed in the kitchen utensils, very clean, and the beds were very comfortable. Having an air-conditioner is great on the island since most homes don't have AC. The property had a very nice open-air palap restaurant on-site that was available for lunch and dinner. Live music was booked some nights. The pool area was very nice, with hot tubs, and a winding pool. The area looked wonderful if you were traveling with children. The unit and the pool used a key-code entry which I really liked. No keys, not was check-in or check-out needed. As always, very good. 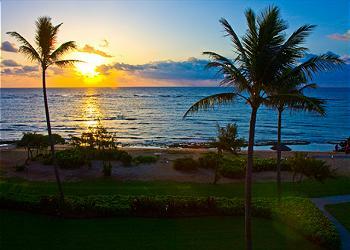 We love Kauai, we love the Kapa'a area, and we love the Waipouli Beach Resort. 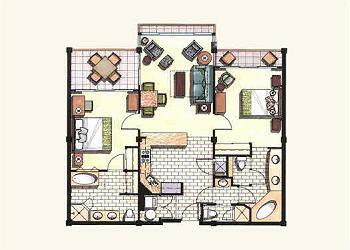 We consider unit A206 the best located in the complex. The only negatives were the 3 false fire alarms (especially the one at 4 am Thursday), and the flaking exterior wall covering (which we understand is being corrected) which fell on the small living room lanai. I almost don't want to write this review because I don't want to have a hard time booking the next time I come to Kauai! We have stayed in this unit multiple times and always have a great experience. 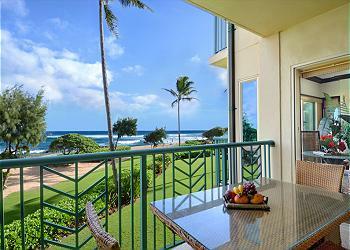 In my opinion, there is not a better place to stay in Kauai. Josh and his staff at Kauai Exclusive Management are great to work with, even giving me options to stay longer when my daughter was taken to urgent care the morning of our departure. Thankfully, she was well enough to fly home that day, but I appreciated the concern and assistance when things were unknown. The unit is well maintained, clean and fully stocked with everything you need (well, almost -- I needed a cheese grater and that wasn't available but fortunately Safeway is right across the street and they had pre-shredded cheese, so my tacos were saved). All in all, this property is the best in terms of location (central to Poipu and Princeville), great shops and restaurants nearby, fantastic pool for both young and old, and it's very well-built meaning you won't hear people talking through thin walls or anything that sounds like a stampede when someone walks above you (both are issues I've had in other condos). You won't be disappointed here and I would highly recommend this resort. Our family of five had a wonderful time. The condo was perfect for us - nice view, super pool & beach, and friendly staff. The location was great for activities both north and south and shopping was just across the street. This was a once in a lifetime trip for us and it couldn't have been better. Excellent Condo. Great Property. Conveniently Located to everywhere we wanted to go on the island. The only minor complaints about the unit were the spotty internet and TV service. Our computers are new Macs and do not have ports to use the available ethernet connections and the wifi that was provided was very very spotty. The TV service was standard def and TV's very old, so TV was hard to watch. But we weren't really there to watch TV so it was fine. We just got back to Colorado from our stay in Kauai. This property was just as advertised and pictured. The property manager and concierge were very helpful. The rental unit was all we could have imagined. Every night we left our balcony doors and listened to the ocean all night with the ocean breeze keeping us cool. The beach front was perfect for relaxing and wading out into the ocean. Wonderful place to stay! We would definitely come again. Highway gets really busy and requires some patience. Duke's Canoe Club in Lihue was a wonderful place to dine overlooking the bay. The Safeway store is directly across from the property with easy access. Enjoyed the condo. You can see some wear on furniture. The place was extremely clean. Would stay again. First time in Kauai and we will be back. We stayed at two different places , here and another in Haena. We liked this one mich better. The room was clean and very nice decor, upscale but I felt the price was fair. Our room was very large and we felt very at home there. We stayed in the A building so has great views of the water. Amazing view. Comfortable beds. The kitchen did not have enough basic pots, pans and utensils. The pool "police" were unnecessary and obnoxious. And the pool towel checkout was lame. The towels should just be in the rooms. The room safe was locked when we got there and we were never able to access it, which was very inconvenient. Beautiful, clean, well appointed accomodations centrally located on the Island. The pool and hot tub, fitness center were all great. The kitchens, bathrooms and guest room accomodations were 5 star. Sofie the Concierge was superb! Great photographer referral with Joel Guy. 10 minutes from the airport and in the center of the island.The condo was very clean and the kitchen was stocked with just about everything you need to cook. Met great new friends at the pool. The management is easy to work with too! Overall, very nice. The is the second time we have stayed in Unit A206 and really like it. We are ready to schedule a return stay. Loved A206 condo! Perfect location, amazing views from every balcony. Spacious, clean, well stocked! We had fun in lazy river, utilized the fitness room, walked along the beach. Shops, restaurants, and groceries are right across the street. We'd definitely go back to this condo! 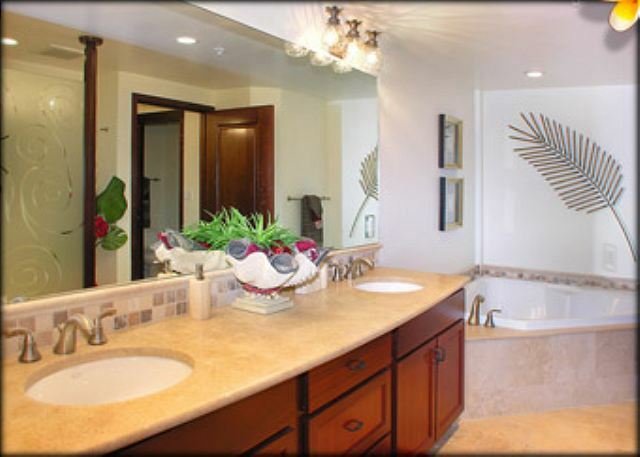 Our condo was absolutely stunning and exactly as pictured on the VRBO site. It was beautiful, well equipped and positioned perfectly right on the beach. The resort pool was spectacular! The grounds were stunning with blooming hibiscus all over. This condo has it all! View, convenience to pool area and beach. The property was fantastic for our family. We enjoyed the kiddy pool, complete with pebble sand, lazy river (though I'm confused why it doesn't go in a circle), waterfalls, and water slides. The restaurant on site was good and accommodated both dining in as well as quick service for pick-up. Our toddler loved the free koi feeding on Thursday and Sunday mornings (8:30am). Good location on the island with about an hour's drive to either end, though the local food options were limited. The unit itself was spectacular - great appliances, huge bathrooms, heavy doors, oceanfront location and view, and quiet location away from the pool and restaurant. We were glad to find beach chairs, a beach mat, snorkeling gear, boogie board, and some sand toys for our use. In a week's stay, we only heard neighbors a handful of times, so very well insulated. Temperature was comfortable with A/C during the day and fans at night (in early June). My only caution is to be aware that the beach in front of the property really isn't suitable for swimming. If you want to give it a try, be sure to bring beach/swimming shoes to protect you from the coral and rocks. The place was beautiful and very clean. It was the perfect place to stay for us. We loved the ocean view. All was amazaing. The sofa and chair in the living room were stained and absolutely filthy. Not at all fitting for the price and otherwise beautiful amenities. We literally put a sheet over the sofa so we didn't have to sit on it directly. We have replaced the Sleeperwith a new one! VERY nice with 7 inch mattress for sleeper .. Mahalo for the insight from our valued guest and Mahalo to the owners for getting a VERY nice NEW piece!!! The Waipouli Beach Resort is a fabulous place to stay. It's beautiful and the pool is awesome! We loved the gorgeous views out all the windows! Lovely apartment was well equipped and lovely. 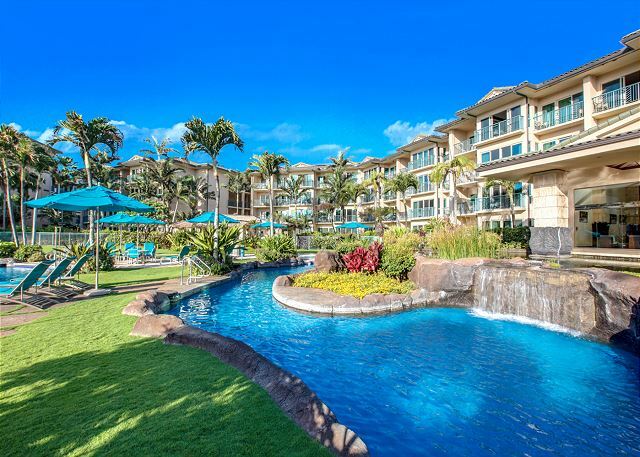 Minor maintenance/housekeeping issues were reported to Kauai Exclusive Management, which was a good company and easy to deal with. This private condo looked great on line and we were not disappointed. 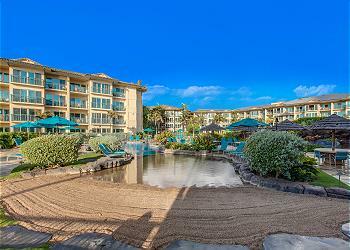 Waipouli Beach is located in a convenient location with good restaurants and Safeway within walking distance. Caters well for children. It has been two weeks since my wife, two daughters and I left Kauai. We are back home in Denver. The temperature is 17 degrees. There is snow on the ground. 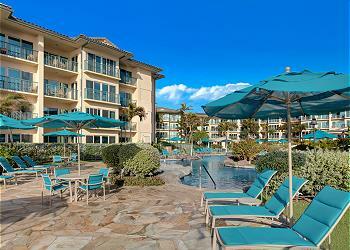 And all any of us can think of are our six days in sunny Kauai at the Waipouli Beach Resort. We stayed in unit A-206, a true beachfront condo on the northeast of the island. This is point of distinction number one. Many beachfront resorts may have 150 or 200 or 300 units... but only a handful are truly beachfront. A-206 sits on the northeast side of the resort, directly overlooking a small private beach. This means the sun rises out of the ocean this morning and you can watch it from your bed. 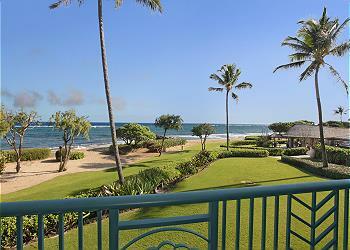 The kids can play on the beach and you can watch them from your lanai. You can leave your doors and windows open at night and listen to the waves crash on the shore. Simply intoxicating. The kitchen is huge, and well stocked. Both bedrooms and large. There is a patio dining space and the double doors in the family room roll open so you can have a wide open view of the Pacific. Again, simply amazing. The two bathrooms are large and clean. The master has a tub, a shower, and a double vanity. The smaller bedroom also a large bath with a tub, shower and a double vanity. The unit is super clean. There's also a stackable washer and dryer, which will get lots of use if you are there for a week. In summary, this is the best vacation rental property I have ever stayed in. Kauai also gave our family the best vacation memories of any trip we've ever taken. 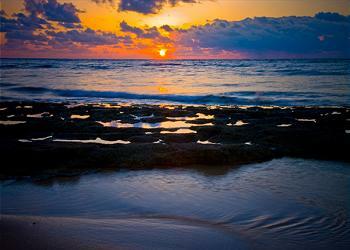 If you are planning to visit Kauai, do not hesitate. Book this unit now. Turn off your computer and cell phone. And enjoy the most amazing place on the most spectacular of the Hawaiian islands. 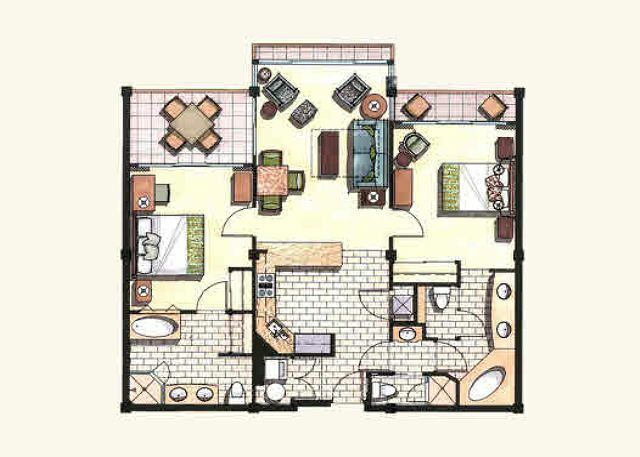 Great layout for a family of four, really appreciated the 2 beds in the second bedroom. Well stocked with kitchen equipment, linens and basic household supplies. 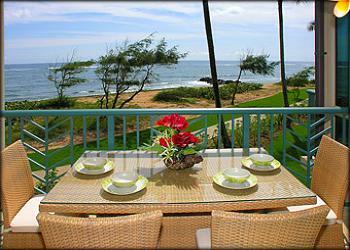 Views of the ocean provided for whale watching, sound of the waves and easy access to the beach for sunrise. A206 Waipouli Beach Resort - Wonderful!! What an amazing place to be able to stay in for 15 days in paradise! My family and I had a great vacation, the condo was amazing and the complex is wonderful too. The kids loved the pool and the beach, great trip! Josh and Sonja from Kauai Exclusive were great, very professional and responsible people, thank you! Issues with reservation and check-in. However, the property was excellent.